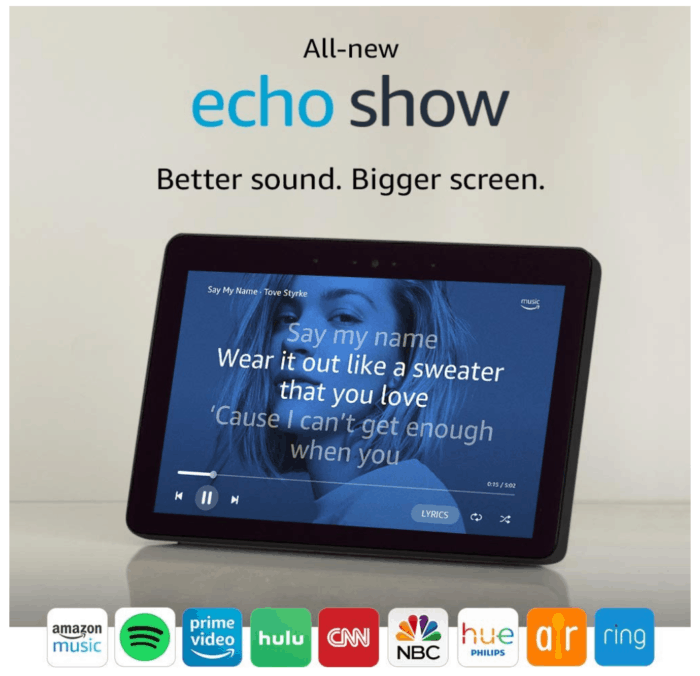 Amazon has the Echo Show 2nd generation a a nice cyber Monday discount! Right now pick up one for $179.99* from $229.99. However if you pick up TWO you will save $120 making it only $339.98 or $169.99* each – you could go in with a friend. That is what we did for our Kids ECHO Dots! This new device has everything you love about Alexa, but now you can also watch video flash briefings, Amazon Video content, and YouTube, see music lyrics, security cameras, photos, weather forecasts, to-do and shopping lists, browse and listen to Audible audiobooks, and more. The new Echo Show is very easy to set up! Use the Alexa App to connect music services you already use like Spotify and Pandora. Link your calendar from Google, G Suite, iCloud, Outlook.com or Office365. Setup your smart home devices from Philips Hue, TP-Link, ecobee, WeMo, SmartThings, Insteon, Wink, Nest, Lutron, and more. Control your timers and set custom tones for your alarms, and much more. Alexa App is available for iOS, Android, and Fire devices.